The Mailing Preference Service is a free service that can prevent your name is added to junk mail databases. You can also use the service to register a previous occupants' name at your current address. The Mailing Preference Service is by far the most popular opt-out scheme discussed in this guide. It's not, however, the most effective scheme - Royal Mail's opt-out for leaflets (the Door-to-Door Opt-Out will stop more junk mail. In fact, the opt-out for unsolicited, addressed junk mail is somewhat overrated. Only members of the Junk Mail Association to check if you're registered; it won't stop junk mail that's the result of failing to tick (hidden) opt-out boxes; and signing up also won't put a stop to those annoying 'To the Occupier' letters. Despite the scheme's shortcomings you should register. You can do so online, via mpsonline.org.uk or by phoning 0207 291 3310. The Mailing Preference Service does have an e-mail address (mps@dma.org.uk) but it's no longer possible to request an opt-out form via e-mail. Which probably is my fault. Many guides to stopping junk mail claim that registering with the Mailing Preference Service will reduce personally addressed junk mail by up to 95% . This statement comes from the Direct Marketing Association, which runs the Mailing Preference Service. For many years I tried to get them to admit the 95%-claim is misleading and could not be substantiated. They finally did so in June 2011 and the claim has been removed from the Mailing Preference Service website. Unfortunately, the '95%-myth' is still widespread. Registering with the Mailing Preference Service isn't going to reduce addressed junk mail by 95%. The scheme will prevent addressed advertisements from organisations that are members of the Direct Marketing Association and who you haven't given permission to contact you. In other words, you'll still get junk mail from organisations that aren't members of the association; and if you're receiving advertisements because you failed to tick an opt-out box when you gave your personal details to an organisation your registration with the Mailing Preference Service isn't going to stop the junk mail. All things considered, the Mailing Preference Service may be able to reduce addressed junk mail by up to 50% – and I'd say I'm being generous here. If the 50%-figure is correct and you're an average person, opting out will stop just over 30 pieces of junk mail per annum. Ever wondered what will happen if you're registered with the Mailing Preference Service as, say, 'Joe Bloggs' and a junk mailer has your name as 'Joseph Bloggs'? The answer is that the sender may ignore your registration. How to deal with these cases is entirely up to the junk mailer. To get the most out of the Mailing Preference Service it therefore makes sense to register any alternative names you may known by. You can register up to five names in one go, which should be sufficient. You're not, however, allowed to register first name initials. This is, presumably, because there may be other people in your household who have the same initial as you. If you register the name 'J Bloggs', say, then junk mailers wouldn't be able to make an intelligent guess about whether the 'J' stands for 'Joe' or any other name starting with a 'J'. Speaking of other people living at your address, you're also not allowed to register generic names such as To the Occupier or The householder. The Direct Marketing Association argues that allowing people to stop mailings with a generic addressee could deprive other people at your address of such advertisements. You might not want such items but your husband or wife might delight in them – and how can the Direct Marketing Association be sure that you don't secretly stop such items for everybody at your address? It's an amazing argument that has created an interesting loophole. Normally, addressed mailings that can't be prevented by the Mailing Preference Service can be stopped by sending the offender a data protection notice. Such notices, however, are only valid if you ask the sender to stop processing your personal details – and a generic entity such as 'The Occupier' is of course not personal. The net result is that 'To the Occupier' can't be stopped. It can take up to four months before your registration with the Mailing Preference Service becomes fully effective , although you should see a reduction in the amount of junk mail you receive in this period. The reason why it takes so long before bulk mailers leave you alone is that it usually takes quite some time to produce a mail-out. (It's worth noting that this argument is not wholly convincing; it would of course be possible to 'clean' a mail-out shortly before it's handed to Royal Mail). Good news is that your patience will be rewarded. As of April 2012 it's no longer needed to re-register every five years. It used to be the case that your name was automatically removed from the Mailing Preference Service database after five years time but this is no longer the case. 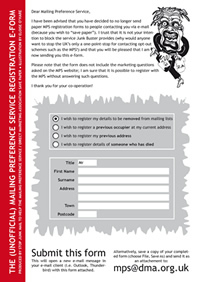 If you register your name will be on the Mailing Preference Service 'suppression file' until the end of time. The Mailing Preference Service will want to see either the original mail item(s) or a full copy of the mailing including the envelope. On receipt of this they'll contact the organisation in question to find out why the mailing was sent. If the British Codes of Advertising and Sales Promotion have been breached your complaint may be passed to the Advertising Standards Authority. Do keep in mind that you're not allowed to complaint about junk mail from organisations that are not a member of the Direct Marketing Association; mailings with a generic addressee (i.e. 'To the Occupier'); items sent from abroad; and mailings from organisations whom you have given permissions (perhaps unknowingly) to send you junk mail. Due to environmental reasons MPS no longer produces registration forms. You can register with our FREE service via our website: www.mpsonline.org.uk or by calling the automated registration line on 0845 7034599." MPS Registration e-Form (click to open as PDF). Interesting to note is that there are perfectly suitable alternatives for paper forms. Take, for example, this Revolutionary MPS Registration E-form. You can download the form, complete it on the computer, and fire it off to the Mailing Preference Service, without having to print it. The form is 100% unofficial and you probably shouldn't use it (my guess is they'll just ignore it). I designed the form just to show that using opt-out forms and saving paper aren't mutually exclusive. As for Junk Buster, the widget still exists, but it no longer sends e-mails to the Mailing Preference Service. It's a real shame, as it does make Junk Buster less useful.